Late night comedy on network television has heretofore been dominated by men from above the Mason-Dixon Line, all with acerbic, often cynical humor, greeting guests in a manner that let them know the host thought the guests were lucky to have a seat on the couch. While Jack Parr and Johnny Carson came from the Midwest and had therefore something like a folksy air about them at moments, at least in their earlier careers, since the 1980s, Late Night Television has been dominated by men from the Northeast. Conan O’Brien is from Boston, and Jay Leno, Jimmy Fallon, Jimmy Kimmel, and David Letterman are all from New York City. This has meant that the tone of The Tonight Show, The Late Show and other shows American viewers watch transmit a sense of a sardonic New York State of mind, a mindset that is by now familiar to Americans as part of staying up to watch Jay Walking, Stupid Human Tricks, or other comedy bits which are as much about laughing at people as laughing with them. New York City would be an unbearable place to live for so many reasons if New Yorkers did not claim the privilege of laughing at the idiotic and pompous, the grating and the lewd, the lunatic and the confused among their neighbors. It is a strategy that all New Yorkers without exception employ on a bad day to get through a stressful time; I speak from personal experience of living and working in New York for decades. But publicly and openly laughing at one’s neighbors is not considered good manners in the South, and The Late Show’s new host Stephen Colbert doesn’t do this. 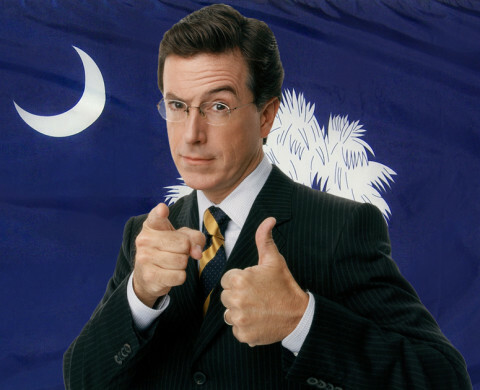 Colbert grew up in Charleston, South Carolina, on James Island, literally at walking distance from the site of the first Civil War battle, Fort Sumter. In Charleston, even the least well-behaved schoolboy learns not to point and laugh at others in public, and by all accounts Stephen Colbert learned good manners in his devoutly Catholic household, replete with Irish guilt, something I can personally attest to as more damning than any fire-and-brimstone sermon if a school child messes up, because in the Irish concept of propriety, one has the ability to shame one’s ancestors at least four generations back and receive their moral condemnation from their seat in eternity. So Stephen — of the rowdy audience chants, “Stephen! Stephen! Stephen!” — treats people with more respect than a guy like Dave Letterman. Understand Stephen Colbert loves to ridicule the rich and powerful, but he does so ironically, usually with a rhetorical strategy that the French call “se foutre de la geule de quelqu’un,” a term untranslatable but demonstrable. The moment he won my heart as a fan was when on his old show The Colbert Report was when he interviewed a Georgia Congressman who was vehemently opposed to gay marriage. Stephen told the Representative, “I love your strong stand against gay marriage, but it doesn’t go far enough.” The Congressman was surprised. Stephen continued, “Why not oppose not only issuing marriage licenses to gay people, but also drivers licences? I mean, I don’t want those people gay-ing up Americas highways.” It was a brilliant way to put the man on the defensive while appearing to agree with him. The Congressman honestly did not seem to know whether Stephen were kidding. For the record, he was. Late night television now has a new, dancing hospitality straight out of the South. Now, in his new role as the host of a more mainstream entertainment show, Colbert has changed the tone from David Letterman’s old tone, which seemed always to be making fun of the institution of the show itself. Stephen fully participates in the genre of show he hosts, and he and his band leader, Jonathan Batiste, dance to New Orleans jazz at the beginning of the show (Batiste is from Louisiana, as a one-minute listen to his music attests), and then the mood is cordial. Stephen’s gentle and personal interview with Joe Biden (whom he clearly wants to run for president) about his son’s death is not the kind of interview Letterman could have conducted. Shortly after September 11, 2001, Dan Rather came on Letterman’s show and burst into tears talking about the tragedy, and while Letterman was not unkind, dropping the sardonic Alfred E. Newman-like grin long enough to say he understood that Rather was crying because “he was human,” Letterman didn’t have a tender bone in his interviewer’s body, not on camera. Stephen Colbert seems rather incapable of treating a guest as anything other than human. In fact, his show’s band’s name is “Stay Human,” which he seems to be trying to do. 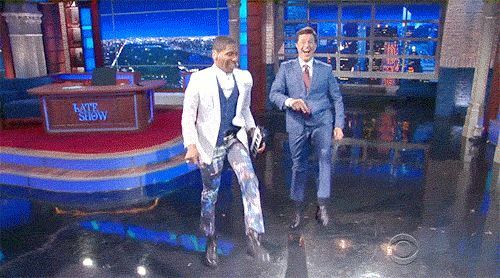 Apart from the manners and compassion that Stephen Colbert brings from the South to late night television, one sees Charleston in his and Jonathan Batiste’s polished manner of dressing. Charleston men are often elegant, and while Stephen doesn’t have the navy nautical blazer over a pair of immaculately pressed khakis that one associates with Charleston gentility, he lacks the slouchy air that Letterman gave in every one of his suits, however well-tailored. We see, too, an honest effort to welcome his guests and to make them feel at ease. While his encounters with food on the show thus far have only been to stuff his mouth with Oreos while making fun of Donald Trump’s stand against the cookie, it wouldn’t be hard to imagine Colbert serving sweet tea to guests. Of course, The Late Show is a New York institution and will remain one. The credits roll with a claymation view of the city emblazoned with guests’ names. The Ed Sullivan Theater is on Broadway, not Meeting Street in Charleston. 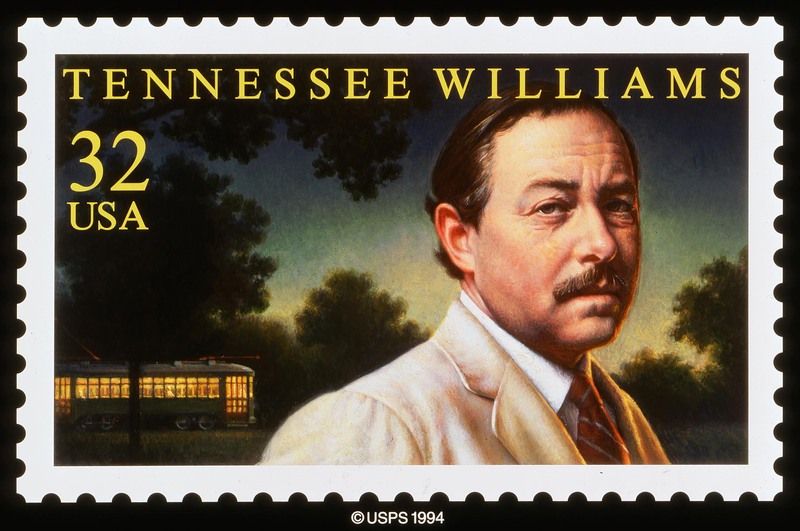 But lots of humorists and figures of American theater moved from the South to make it in New York ,and New York is as glad to see Southerners as they are glad to see anybody, which means only that they grudgingly scoot down the subway bench to make room for them, too.